Sun is mother of life, without it, nearly all creatures die. Sun is also the mother of civiliation, without it, agriculture, navigation might not be developed fast. Sundial or Sun Clock is an instrument telling time by the positions of the sun. Sundial may be the oldest of all scientific instruments. Nowadays, sundial is not only an instrument, but arts and crafts. Although the Sun is our mother, most people do not trust her, most people think that Sundials are not accurate, they tell the incorrect time. However, we could as easily say that sundials tell the correct time but clocks do not. It all depends on how we measure time. 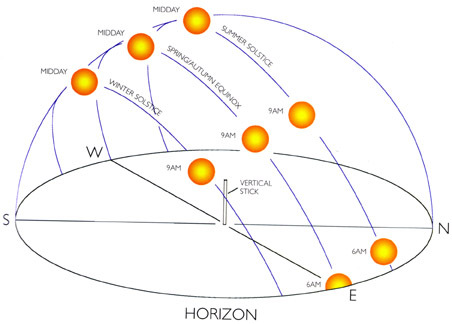 If we define Day as the period we can see the Sun and Night as the period we cannot see it ( ignore the bad weather, clouds, ...), Day time is longer in Summer and shorter in Winter. Therefore, Day and Night is not equally divided into 2 parts, A.M, P.M., as we use in our daily life. 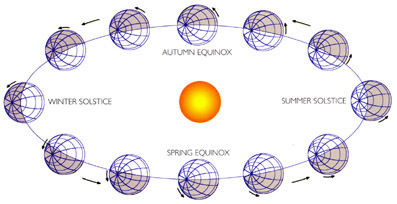 To astronomers, sun time is called Apparent Solar Time, and clock time is called Local Mean Time. The word MEAN suggests that while the sundial is accurate, the clock only shows the Average value. The difference between these 2 time varies every day of the year. Fortunately, the values are very close from one year to the next. This difference is called Equation of Time (EoT). In different places, the sun time is different; therefore we cannot use one sundial around the world to replace the clock. The sun rises in the east and for every degree of longitude west from a reference point, 4 minutes should be added to the sundial time, and eastwards substraction is needed. The black lines indicate the shadows of Sundials. As mentioned above, If the sundial at the center is the reference, the one on the West shows 11:56 a.m., so you need to "add" 4 minutes to tell the right time. The one on the East shows 12:04 p.m., you need to "subtract" 4 minutes to tell the right time. If you would like to learn more about the Sundials, this book is for you.